Had a pleasant and comfortable two-night stay here. Acommodation clean and cosy.The bars were all quite busy, but the service was prompt and the food was fine.Great choice of ales and a relaxing atmosphere.When I told my outdoors-loving brother we were staying there, he described it as "legendary" - with good reason. A retro rate, I visited The Clachaig on Aug 30th 2014 after climbing Bidean nam Bian, and heading back along The Lost Valley, a long hot day! We nipped in here for a well earned pint on the way back to Glen Nevis. It was quite quiet, just a few folk in the large bar, a good atmosphere tho! I enjoyed the pint of Trade Winds, one of the many handpumps available that day. The staff were friendly and asked where we'd been and recommended other local walks. I'd definitely return! The veggie haggis with tatties and neeps here was fantastic. Sadly a couple of the pints marred this with a couple of them being a bit past it. Loved the pub though. First time back in a number of years. A classic walkers and mountaineers pub. 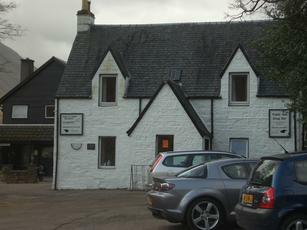 I've visited the Clachaig Inn on a number of occasions over the years, the last being a fortnight ago. It's a magnet for any person taking part in outdoor activities, and the only place really worth visiting in the Glencoe area. The Clachaig has three bars in total, each with its own character. Real ales, malt whisky and good food are served in each of the bars, with the Boots Bar serving the larger variety of ales, and this is where you'll find the majority of walkers and climbers. The venison burgers are extremely filling and they are not mean with their portions either. Although the Clachaig may be a winner of the CAMRA "Best Pub in Scotland" award, I have found that the ales can be a little "hit and miss" on each occasion I have visited, and certainly the first pint of the Isle Of Skye Brewing Company's "Red Cuillin" ( 4.2% ) had a distinct touch of the "Sarsons" about it. It was changed without any hassle, and I have found the bar staff are more than happy to give you a "taster" if you ask. The Atlas Brewery "Three Sisters Scottish Ale" ( 4.2% ) was a dark refreshing pint in good condition. The Caledonian Brewery's "Dunkelweiss" was a particularly dark and delicious wheat beer. Also amongst the various ( exclusively ) Scottish ales available over the weekend was "Latitude" ( 3.6% ) from The Atlas Brewery described as a "Cask Pilsner" and a couple from The Cairngorm Brewery. There are fifteen engines on the bar and eight to ten were in use at any one time. Sunday afternoon was a very jolly affair in the Boots Bar, quaffing industrial quantities of ale and gargantuan amounts of food, whilst listening to classics on the juke box such as "Who killed Bambi?" ( Tenpole Tudor ) which was very apt considering where we were, Jilted John, Carlos Malcolm & His Afro Jamacian Rhythms, The New Vaudeville Band and John Otway. A great place let down somewhat by the beer, so regrettably only a 7/10 instead of an 8/10. Whilst in the area, The Kingshouse inn and hotel is also worth a visit and can be found at the eastern end of Glen Coe at the junction with Glen Etive. Good atmosphere in the back bar, generally a good selection of ales and whisky. You might feel a bit conspicuous if you're not an outdoor type - but why would you be here in the first place? The Clachaig effectively has a captive market and doesn't have to try too hard (it must be an absolute goldmine for the owners), but actually the staff and general ambience are pretty good. Food is fair value, simple stuff. The Clachaig effectively has a captive market and doesn't have to try too hard (it must be an absolute goldmine for the owners), but actually the staff and general ambience are pretty good. One weird thing - if staying there, be aware they don't do breakfast before 08:00 which is very strange for a place aimed at climbers and walkers.